“Seated Green Tara,” 17th–18th century. 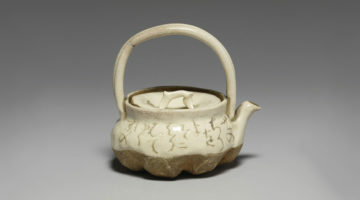 Available under OASC permissions via The Metropolitan Museum of Art. Since becoming ordained four decades ago, Lama Tsultrim Allione has faced her share of challenges and sexism. Throughout it all, Tara’s vow to work for the benefit of all beings in a woman’s body has been a source of guidance and inspiration. When I think about women and Buddhism, the first thing that always comes to mind is the story of Tara’s vow. This story expresses our situation so clearly and applies equally well to both ancient and modern times. It is a story that originated when Mahayana was integrating with tantra, ultimately forming what became Vajrayana in India. It is emblematic of a wave of stories that followed about powerful women who valued themselves as women within Buddhism. 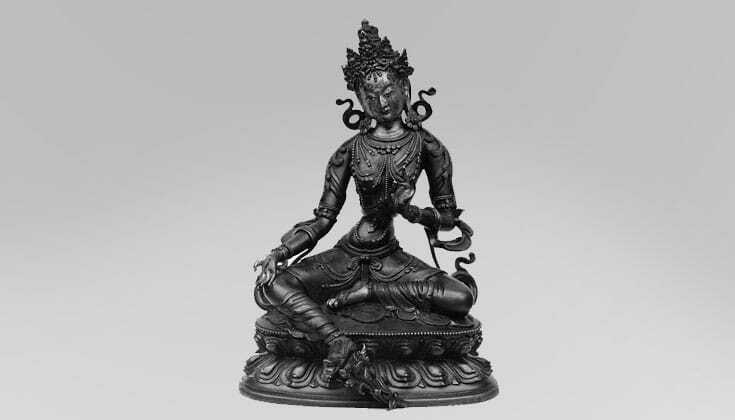 Many of the stories from that era in India (around 700–800 CE) tell us what was happening both sociologically in the culture, and developmentally in Vajrayana. During this period, for the first time Buddhism had women teaching men. 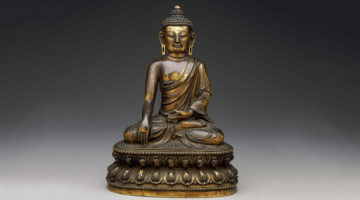 It was also the dawn of female buddhas and the feminine wisdom principle, which began with Prajnaparamita, the “Mother of All the Buddhas,” in the Mahayana period. The story tells us that Tara was a princess named Wisdom Moon, who was very devoted to the dharma and had a deep meditation practice. She was close to enlightenment, raising the intention to reach enlightenment for the benefit of all beings, when a monk approached her and said what a pity it was that she was in the body of a woman, because she would have to come back as a man before she could become enlightened. The princess answered back brilliantly, demonstrating her understanding of emptiness and absolute truth, saying, “Here there is no man; there is no woman, no self, no person, and no consciousness. Labeling ‘male’ or ‘female’ is hollow. Oh, how worldly fools delude themselves” (Taranatha, Origin of the Tara Tantra). From that time onward, the princess dedicated herself to realizing complete enlightenment. Once she accomplished that goal, she came to be known as Tara, the Liberator. I like to say that Tara is the first “Women’s Libber” and that Green Tara is the spiritual leader of the Green Party, guardian of the forest, fast acting and compassionate, with one foot in the world and one foot in meditation; a place where many of us find ourselves. As a practitioner of Buddhism, I don’t think about myself in terms of gender. I try to cut through such concepts and rest in the true condition of unborn and unceasing luminous emptiness, the ground of being. However, I have continued to be committed to the reemergence of the sacred feminine in the Buddhist tradition. I don’t see any conflict or dissonance in these two views. This commitment has manifested at Tara Mandala, my retreat center in southern Colorado, where we have built a three-story mandala temple dedicated to the twenty-one Taras, all various aspects of the enlightened feminine. The interior of the temple is home to life-size golden statues of these Taras circling the ground level, similar to the ancient goddess temples of India. Having come from a family of accomplished women who were respected and valued equally to men, I never felt that there were certain things a woman couldn’t or shouldn’t do. So when I began studying with the Tibetans in 1967, I had no particular awareness of gender prejudices. After my ordination by His Holiness the Sixteenth Karmapa in Bodhgaya in January 1970, I set out on my life as a Buddhist nun. Because of the lack of available translations, I had only a general idea of the vows I had taken, and lived blissfully unaware of the historical inequalities between monks and nuns for several years. I had been ordained as a sramanerika (getsulma in Tibetan), or novice, with just thirty-six vows, and didn’t learn until later that the Buddha had given extra rules of discipline to fully ordained women. According to some Vinaya traditions there are 311 vows for fully ordained women bhiskunis, or gelongma, compared with 227 vows for men who become bhikshus. Many of the extra vows have to do with nuns’ subordination to monks. According to stories in the Vinaya, Gautama Buddha refused to admit women to the monastic order several times before he finally agreed to do so at the persistent request of his stepmother, Mahaprajapati,and the strong intervention of his cousin Ananda on her behalf. Mahaprajapati was not just any woman asking to become a nun. She was his own mother’s sister, and had nursed and raised the Buddha from the moment of his mother’s death shortly after he was born. When he opened the sangha to women, it is said that the Buddha also made it more difficult for them to be ordained and made them subordinate to all monks. Supposedly, he also predicted that admitting women to the sangha would shorten the life of the sangha by five hundred years. However, it’s not known whether these stories are historically accurate or whether, as some Buddhist scholars suggest, they were written later by androcentric and patriarchal monks. To the credit of my teachers in my early days as a nun, I never felt any misogynist tendencies and had full confidence that I would have complete access to the teachings whenever I was ready for the next step. My first awakening to sexism in Buddhism came when I went to attend a three-month series of empowerments in India given by Dilgo Khyentse Rinpoche in Tashi Jong near Dharamsala in 1973. When Ani Jinpa, a Dutch nun, and I were looking for seating, we were told that we had to sit behind all the monks, including the recently ordained, six-year-old squirming little monks who could not yet read. I was surprised and a little disappointed in my adopted religion. For three months, we sat way at the back of the temple, squeezed between the child monks and the constantly chatting laypeople surrounded by their children. It got me thinking. That same year, I decided to disrobe—not because of the sexism I saw in Buddhism, but because I could see no future for myself as a nun. I was the only Buddhist nun in the Tibetan tradition in America, which was where I was trying to live and study with Chögyam Trungpa. At one point, I asked Trungpa Rinpoche for a text on the feminine principle in Buddhism, and he gave me a big Tibetan volume on Prajnaparamita. I never managed to do anything with this text because I was soon to become a mother of three. I really became interested in looking at the stories of women in Buddhism when I lost a child in the spring of 1980. She was the twin of my son Costanzo and succumbed to sudden infant death syndrome when she was two months old. After Chiara’s death, I felt a deep need for the stories of women in my tradition. I needed to know their lives. The biographies of men weren’t helping me. I couldn’t find any stories of women, and in the few references to women in The Hundred Thousand Songs of Milarepa I read things like, “Because of my sinful karma, I was given this inferior female body.” I didn’t believe that. 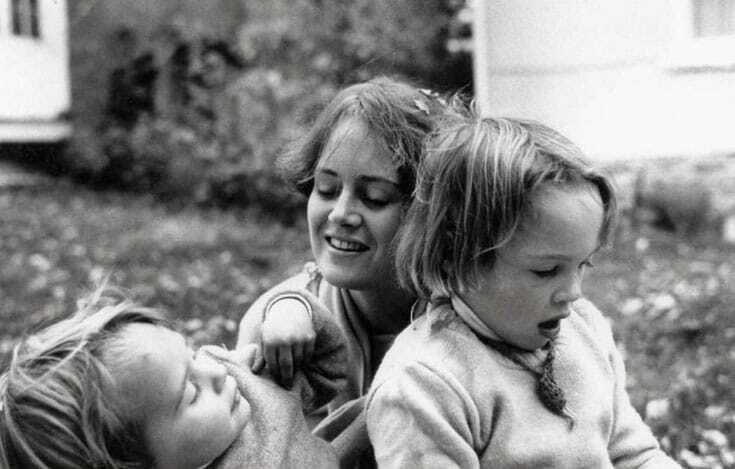 Lama Tsultrim Allione with daughters Sherab and Aloka in 1978. The rebalancing of genders currently under way may be the greatest achievement of this century. The stories that I finally found gave me strength and inspiration, and the research awakened me to a broader awareness of women and women’s issues around the world. The rebalancing of genders currently under way may be the greatest achievement of this century. It has been very moving to me to watch this movement going forward in various forms all over the planet. In some countries, old forms are being revolutionized, but in others we can see resulting reactionary repression. The rights of women, their freedom, safety, and protection, are essential to the survival of the human species. How can any of us thrive if the voices of half the population are not heard and valued? These are the voices of women, who have historically spoken overwhelmingly on the side of nonviolence, peace, and protection of the earth. And although many countries have put into place national policies for women’s rights and protection that are consistent with steps taken at the international level, it is obvious that there are still obstacles to the elimination of discrimination and violence against women and to achieving gender equality. Recent statistics show that two-thirds of the world’s illiterate adults are women, and downward trends have deepened during the recent global economic and social crisis. On July 22 of this year, I suddenly lost my husband of twenty-two years, David Petit. He had a special death with auspicious signs, but it was a shock for him to pass away at fifty-four with no warning. 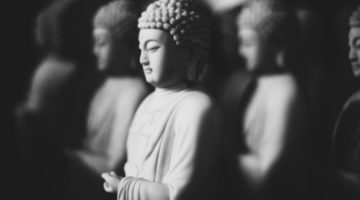 In my grief, I wondered if I could write this piece, but in thinking about it I realized it was important to express the deep gratitude and appreciation I feel for the masculine within the struggle for gender equality in Buddhism. David was an embodiment of a powerful masculine force that actualized everything at Tara Mandala over the last seventeen years—from the first yurts and tents, to our community building, the residence hall, and finally the beautiful three-story mandala Tara Temple. He also stood by me through thick and thin, through the challenges of starting a center and through attacks on me for being “too feminist,” and therefore “not understanding non-duality.” He supported me in my stand against sexual exploitation of women by male teachers, and protected the women who came to Tara Mandala. In the wake of his passing I am acutely aware of the role that the positive masculine plays in the balancing of our world and how important deeply respectful partnership is in establishing Buddhism in the West. This is true not only between partners in a couple, but in our relationships with friends, families, teachers, students, and within the sangha. I feel it is important to acknowledge and value the great men who are actively engaged in bringing wholeness and equality to the Buddhist world, as well as to honor the many women who have struggled and sacrificed to this end. The absolute truth of the emptiness of gender and the relative truth of a real historical misogynist attitude in Buddhism lay side by side in Tara’s story. Her final vow to always return as a woman and to reach enlightenment as a woman shows both her understanding of absolute reality and the relative need for women to be valued and treated equally in Buddhism. Lama Tsultrim Allione is the founder of the Tara Mandala retreat center in Pagosa Springs, Colorado, and author of Women of Wisdom and Feeding Your Demons. In 1970 she became one of the first American women to be ordained in the Tibetan Buddhist tradition. She was a 2009 recipient of the Outstanding Women in Buddhism Award. Thank you for this poignant article! 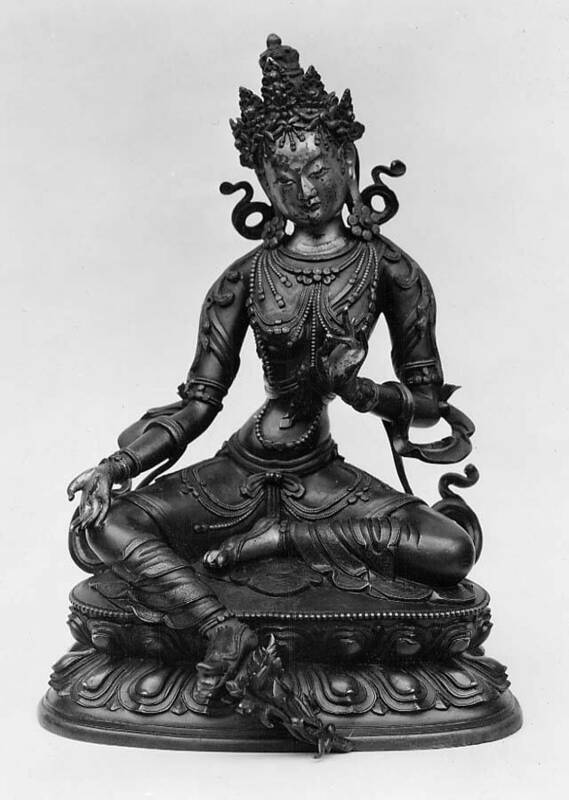 It’s sad that buddhism hasn’t been supportive of women across the centuries, but it makes me deeply happy to learn more about the story of Tara and about the dakinis. I was disappointed when I learned that the tibetan word for ‘woman’ means ‘lower birth,’ but it’s good to know that the dakinis were feminine embodiments of wisdom. I also felt deeply sorry that at a lecture by Dilgo Khyentse Rinpoche you had to stay near laypeople, it only showed that buddhist sanghas tend to be sexist at times. It also made me sad to know that nuns had to make more vows than monks, so that women were subordinates. Despite all that, the buddhist community seems to be growing more receptive towards women, as you’ve said, mentioning the Dalai Lama, who said women should be more participative in politics in order to achieve world peace. In a personal level, I’m proud that my teacher of buddhism is a woman. I also love to listen to the teachings of Jetsunma Tenzin Palmo. The other day I watched this video of her teaching in Brazil about shamatha meditation. It’s a lengthy lecture, but totally worth watching! Thank you for this clear view of women in Buddhism! I am thankful for your voice representing us all!